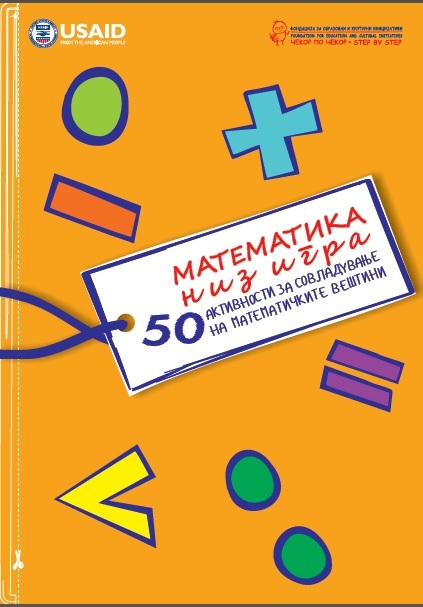 The Macedonian handbook Math through play is comprised of 50 activities that aim to improve lower grade students’ numeracy skills. All activities are divided in six teaching and learning areas (Numbers; Math Operations; Measurement; Data Analysis; Word problems and Geometry) as defined in the Macedonian national teaching curricula. The Handbook describes each activity separately, including the necessary materials, the preparation process and the method of conducting the activity. Additionally, each activity is supported with one or more photos presenting the preparation process. All of the activities can be easily replicated in the classroom with affordable and easy-to-get materials. This manual is a useful resource for the lower primary grade teachers and to the parents. Both teachers and parents can use one activity at a time and in this printable version of the Handout they can also write their comments when conducting the activity with their students/children.